Thomas William McPherson - Edmonton's Burial & Cremation Professionals | Trinity Funeral Home Ltd.
Thomas William McPherson, known to all as “Bill” passed away after a courageous battle with Mesothelioma, on July 18, 2017 at the age of 77 years. 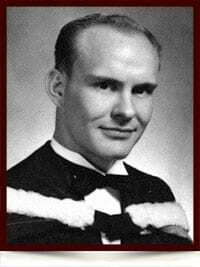 Born in Estevan, Saskatchewan, he attended the University of Manitoba and graduated with a degree in Mechanical Engineering. In 1963 he began his career with Alcan in Arvida, Quebec, and later worked in Kingston, Ontario and Fairmont, West Virginia. In 1971 he became Chief Engineer at Ipsco in Regina, Saskatchewan. In 1988 he moved to Cambridge, Ontario with Courtice Steel and St Mary Cement in Bowmanville, Ontario and ended his career in Burnaby, British Columbia as General Manager of Apex Industrial Movers. Bill was a strong family man with an adventurous soul. His family benefitted from many camping adventures across North America and gained special memories in each place lived. He is survived by his children, Angie Grzyb (Mike), Heather Baumgardner (Darren), Brenda Bilton (Gord), Jim McPherson (Zoe McDougall), Marie McPherson (mother of his children) and grandchildren Bree and Shea Bilton. His brothers and sister Don McPherson(Elaine), Alec McPherson (Carolyn), Gord McPherson, Betty McPherson, Doug McPherson(Laurie) and many nieces, nephews, aunts, uncles and cousins. He is predeceased by his beloved father and mother James and Dorothy McPherson. A Celebration of Bill’s life will be held on Saturday, August 26th in Weyburn, Saskatchewan. Memorial donations in memory of Bill can be made to the Canadian Mesothelioma Foundation – www.cmfonline.org. On behalf of the entire Braseth Beach Condominium Corporation community, our deepest condolences to Bill’s family and friends. Bill’s kindness and thoughtfulness will be truly missed. Thank-you Jack for your condolences. We appreciate your thoughtfulness on behalf of the community. Dad spoke fondly of his time spent out at Braseth Beach. We are so saddened by Bill’s death. We got to know Bill through the community of ‘Braseth Beach’. What a fellow he was! Kind, thoughtful, generous and humorous, but above all, his positivity stood out as such a bright light. Having served with Bill on a couple of volunteer committees, his hard work and selfless contributions were remarkable and memorable. To ALL of you as family, celebrate your wonderful memories with laughter, tears and stories. A ‘special’ character indeed! Our thoughts will be with you on August 26th as you gather to say goodbye to such a special man. Thank you Brian and Wendy. Thank-you for your condolences. Dad’s time spent out at Braseth Beach were special to him. Your father will truly be missed. He spoke of his daughters often and fondly. He was very very proud of his children. Thank you for the thoughtful words , Jacquie. He enjoyed playing Santa and talked about it often. I believe we have the video and pictures, but if not will be in touch….thank you. Thank you Jacque – he did speak of his Santa Claus event with me as well. He enjoyed playing the role and making the spirit become real for everyone. Bill “aka” Santa Clause. Bill was our neighbor and our friend. He lived just down the road from us at Braseth Beach. He always said hello and was incredibly kind and friendly to us and our daughter Auria. I asked Bill if he would volunteer to be Santa for my daughters preschool at Xmas time 2 years ago. He wasn’t quite sure at first but he finally accepted the challenge. He was amazing. He sat each child on his lap and asked them their name and if they had been good and listened to every question they had. Her elf on the shelf is “Charlie”. And he asked her if Charlie had brought her the special gift that he had sent her the previous evening? Mommy that really was Santa clause. He knew what Charlie brought me. I smiled at her and tried not to cry because what more could anyone ask for than to truly believe in Santa Claus. And Bill my dear friend you made that happen. I have photos of Bill and video if you wish to have any as Santa clause. Thank-you for your condolences. Dad was very touched being able to play Santa. I have seen all the photos and the videos. It was special to see how dad was able to take away the fear of the kids when they sat on Santa’s lap. I know the hugs he received from the kids were special to him and he was so happy to put smiles on their faces. He spoke often of this experience and treasured the moments. He has also spoken very fondly of your family. I am so sorry for your loss. Please accept my condolences. I was a close friend of your Mothers throuhout high school and knew both your Mom and Dad well. I was also a bridesmaid at their wedding. I am so very sorry for your loss. Please accept my condolences. I was a very close friend of your mother’s through highschool and knew both your mom and dad well. I was also a bridesmaid at their wedding. Thank-you Liz for your condolences. It is so nice to hear from old friends. Your thoughtfulness is appreciated. I was saddened to read of Bill’s passing. Please accept my condolences. Bill and I went back a long time ago in Weyburn, attending Assiniboia Public school and the Weyburn Collegiate.I will remember Bill as a very determined person in everything he did,,,,,repairing a totally wrecked 1956 Ford at age 16, playing high school football for the WCI Eagles, playing a rugged game of hockey in Weyburn Minor leagues as well as Old Timer’s Recreational hockey in Regina, excelling scholastically in all grades, and being a BIG BROTHER to his siblings. We will miss his great attitude and friendly personality. Thank you for your thoughtful words and memories of Dad. Thank you Ed – my Dad mentioned you often. Thank-you Ed for your condolences. It was good to hear of your fond memories of dad.